Charlotte Observer journalist Fannie Flono and Emily Zimmern, former president of the Levine Museum of the New South, will receive honorary doctorates during UNC Charlotte’s May commencement. The University will hold three ceremonies to bestow undergraduate, master’s and doctoral degrees upon approximately 4,390 students. 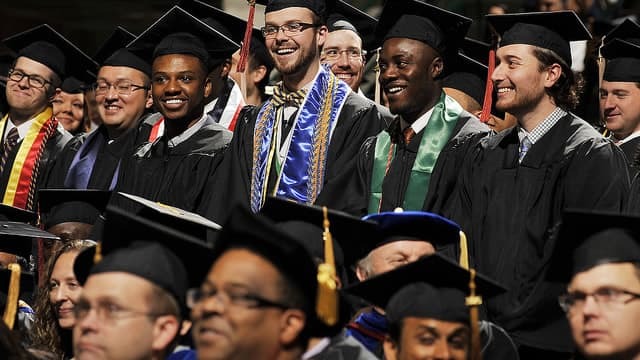 At 1 p.m., Friday, May 13, degree candidates for the Belk College of Business, College of Computing and Informatics, College of Health and Human Services and the Graduate School will gather in Halton Arena of the Barnhardt Student Activity Center for commencement. On Saturday, May 14, the College of Liberal Arts & Sciences — the University’s largest college — and the Graduate School will award degrees at 10 a.m., and the College of Arts + Architecture, College of Education, the William States Lee College of Engineering and the Graduate School will confer degrees at 3 p.m.
Honorary Doctor of Public Service degrees will be awarded to Zimmern at the Saturday morning ceremony and to Flono during the afternoon event. In a 30-year career with the Charlotte Observer, Flono served as editor at nearly every level, including metro editor, political editor, associate editor and as public editor, during which time she conceptualized and coordinated yearlong, citywide race discussions. She served as a vital voice for the underdog, the disenfranchised and the aggrieved, and her columns, syndicated in a number of newspapers, addressed powerful issues – including education, poverty and racism. A graduate of Clark Atlanta University with a Bachelor of Arts in Journalism, Flono was appointed the Batten Professor of Public Policy at Davidson College in 2008. Additionally, she taught editorial writing annually at the Freedom Forum in Nashville and coordinated a Charlotte Observer team-teaching course at Johnson C. Smith University for four years. Zimmern has made lasting contributions to Charlotte’s educational, civic and cultural foundations during her 20-year tenure as the executive director and president of the Levine Museum of the New South. Under Zimmern’s leadership, the Levine Museum attracted national attention as a place of thoughtful dialogue, an advocate for inclusion and a catalyst for community outreach. She collaborated with UNC Charlotte on a number of initiatives, including the New Courage Project, the Center for the Study of the New South's annual lecture and the Changing Times, Changing Minds series, which have strengthened and enriched the museum’s programming. During her tenure, the museum received numerous accolades, including two Excellence in Exhibition Awards from the American Association of Museums. At the White House in 2006, First Lady Laura Bush presented the Levine Museum with the esteemed National Award for Museum Service. A native of Louisiana, Zimmern earned bachelor’s and master's degrees in American history from Vanderbilt University and an MBA from Queens University of Charlotte. Also during Saturday morning’s commencement exercises, Stanley Schneider, a professor in the Department of Biological Sciences, will be acknowledged for his selection as one of the 2016 recipients of the UNC Board of Governors Awards for Excellence in Teaching.